Home / Blog / Happy Birthday, Houdon! 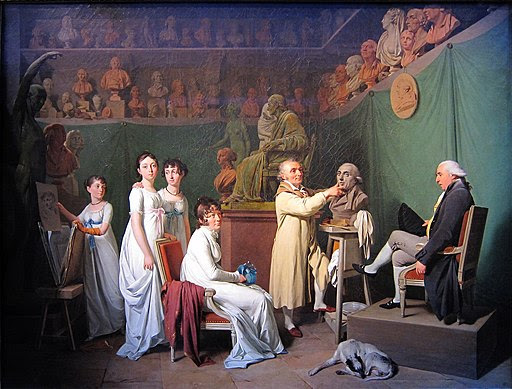 278 years ago today, the famous French sculptor Jean-Antoine Houdon was born! Houdon was active during the Enlightenment and is known for his many sculptures of significant figures of the time. These portraits are often considered the best likenesses of those people, and it’s not hard to imagine why – the faces are incredibly life-like. His subjects included the philosophers Voltaire and Denis Diderot (the bust of whom launched the sculptor’s career), the American Revolution heroes John Paul Jones and the Marquis de Lafayette, the Founding Fathers of the United States Benjamin Franklin, Thomas Jefferson, and George Washington, Empress Catherine the Great of Russia, Napoleon Bonaparte of France, and American inventor Robert Fulton. The influences on Houdon’s style were antiquity, the Baroque, and naturalism. His other works consisted of portraits of children, including his own, and figures such as the Vestal, the Peasant Girl of Frascati, Winter, the Bather, Saint Bruno, and John the Baptist. In preparation for John the Baptist, Houdon created an anatomical study which became a work in and of itself. The Caproni Collection offers casts of several artworks by Houdon that you can find here. We hope you’re as inspired by him as we are! For further reading check out The Metropolitan Museum of Art's essay on Houdon by Johanna Hecht and Anne L. Poulet's exhibition catalog Jean-Antoine Houdon: Sculptor of the Enlightenment.